WARNING: The premise of this film contains unmarked spoilers for the story thus far. Dire circumstances have torn the Fellowship of the Ring apart. Gandalf the Grey sacrificed himself to fend off the powerful Balrog, Boromir was mortality wounded in an Uruk-hai attack after attempting to take the One Ring in desperation, and Merry and Pippin have been taken captive. This has prompted Frodo and his friend Sam to journey alone to Mount Doom on their quest to destroy the One Ring, though they soon find that one of the ring’s previous owners is interested in reclaiming it. Meanwhile, Aragorn, Legolas, and Gimli, have happened upon the Rohirrim. Their leader, Éomer, has informed them that Saruman’s servant, Grima Wormtongue, has manipulated their king into turning a blind eye to the forces of Mordor running rampant throughout Rohan. As the One Ring draws closer to Mount Doom, the flames of war threaten to erupt in a mighty conflagration. In a lot of ways, The Two Towers is to The Fellowship of the Ring what countless superhero film sequels were to their respective predecessors. That is to say, while The Fellowship of the Ring established the world, its characters, and its central conflict, The Two Towers wastes little time jumping into the thick of things. Superhero films would begin with the title character’s origin story. While people were waiting for the pieces to fall into place in the first half of the original film, they could take comfort in how the sequel would be a completely original story free from the audience’s expectations. Obviously, that’s not entirely the case with The Lord of the Rings, as the stories had existed for nearly five decades before these films premiered, but the principle is similar. Anyone familiar with the history of The Lord of the Rings knows that as beloved as the story is these days, they were not popular at all when they debuted. Choice quotes from the New York Times described the writing of J. R. R. Tolkien as both “high-minded” and “death to literature itself”. Despite this blatant contradiction, the sentiment was clear and far from an isolated incident. Critics writing for The New Republic felt the book and its characters were “anemic, and lacking in fiber”. It was even to the point where even Mr. Tolkien’s friends eventually asked him to stop reading samples of the book to them. One such friend, Hugo Dyson moaned “Not another elf!” during one reading, predicated with an expletive for good measure. Ultimately though, The Lord of the Rings ended up being to literature what The Rite of Spring was to the world of music. Igor Stravinsky’s 1913 orchestral concert work was ill-received when performed in Paris due to having sounded like nothing anyone had ever heard before. In 1940, it received vindication from an unlikely source: Disney’s Fantasia, which featured a unique blend of animation and classic music. Similarly, The Lord of the Rings would become revered as a classic once baby boomers came to age and effected the hippie movement. This could be seen in how the legendary rock band Led Zeppelin would regularly insert references to The Lord of the Rings into their songs. Though it may sound like as though The Lord of the Rings received its new lease on life in an unlikely manner, I could easily see why it proved so popular with the hippie movement. Saruman’s conquest, which involves reducing nature to cinders in favor of bringing forth an age of metal and steel, would be the perfect antagonist in a story beloved by hippies. It is, then, highly fitting that the ones who raze Isengard, the wizard’s base of operations, are the Ent – treelike people. For that matter, the One Ring itself could be read as an attack on materialism, another staple of the hippie ethos. Its effects were apparent in The Fellowship of the Ring wherein the mild-mannered Bilbo lashed out at Frodo for the opportunity to hold it one last time. However, The Two Towers sees fit to formally introduce Gollum, the one who owned the ring for five centuries before losing it to Bilbo. Prolonged exposure to the One Ring warped his body and mind beyond recognition. He now fluctuates between his former self, Sméagol, and his newer personality, who will stop at nothing to get his treasure back. As Frodo and Sam make their way to Mount Doom with the unstable Sméagol guiding them their former companions, Aragorn, Legolas, and Gimli are embroiled in a conflict of their own. Gandalf has been resurrected as Gandalf the White, and after he releases King Théoden of Rohan from Saruman’s influence, they must now contend with the evil wizard’s counterattack. He decides to relocate his citizens to Helm’s Deep where they are to make a last stand. To me, this sequence brings to mind to mind the historical battle of Red Cliff in how a loosely formed alliance must persevere against force that has the advantage in sheer numbers. Then again, Mr. Tolkien had participated in the Battle of the Somme during the First World War. It was one of the bloodiest battles in human history, and during the conflict, he lost many of his closest friends. Having witnessed the horrific nature of war firsthand, I could tell he was able to transplant those experiences into his story. Mr. Jackson’s take is a truly is an incredible sequence where you’re constantly hoping for the protagonists’ survival, and when major characters die, you feel it. The story also doesn’t feel as though it has more characters than it knows what to do with, which is an easy mistake to make whenever one is conceiving a high fantasy epic. It’s helped by the fact that there are multiple plots advancing at the same time. Merry and Pippin didn’t contribute that much in The Fellowship of the Ring, yet here, they’re the reason the Ent decide to go to war against Saruman. Along those lines, what I feel to be the best part of The Two Towers is how it never feels as though you’re ever actively waiting for the inactive plot to pick back up again. It’s a true testament to Michael Horton’s skill as an editor that the scenes never end on an unsatisfying note. When the film switches focus from Frodo to Aragorn and vice versa, it’s never in a way that forces the two plots to actively compete with one another. Frodo’s journey to destroy the One Ring and prevent Sauron from being restored to his full power is just as important as Aragorn’s defensive efforts. After all, there’s not much point in destroying the One Ring if there’s no world left to save. It’s incredible to watch these events unfold, and every single one of the film’s 179 minutes are utilized to their fullest extent. 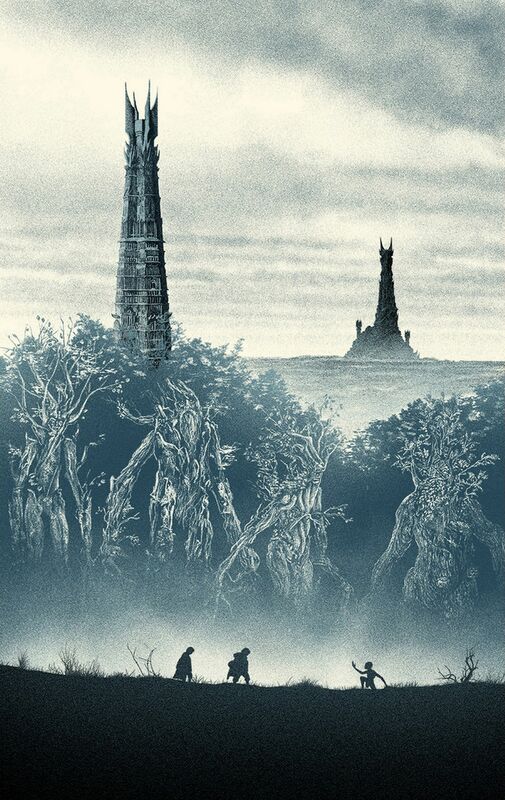 It has been said that The Two Towers was the single most difficult film in the trilogy to complete. This sentiment is quite understandable. The Lord of the Rings was a singular story originally stretched out over three volumes, The Fellowship of the Ring being the introduction and The Return of the King serving as the grand finale. As such, to film The Two Towers would be to craft a story with neither a beginning nor an end – a truly nightmarish task in any medium. It is likely for this exact reason that Ralph Bakshi’s animated version opted to combine The Fellowship of the Ring with the first half of The Two Towers. This way, the film would end on a cliffhanger to be definitively resolved in the next installment, which unfortunately failed to materialize. Because of this, it’s plain to see that Peter Jackson and his crew had no other examples to draw upon when making The Two Towers. Along the same lines as its predecessor, The Two Towers should be judged on how effective it is as the second act of this story. In this regard, I have to commend Mr. Jackson and his crew for somehow filming what amounts to an isolated second act while still giving it a logical beginning, middle, and end. 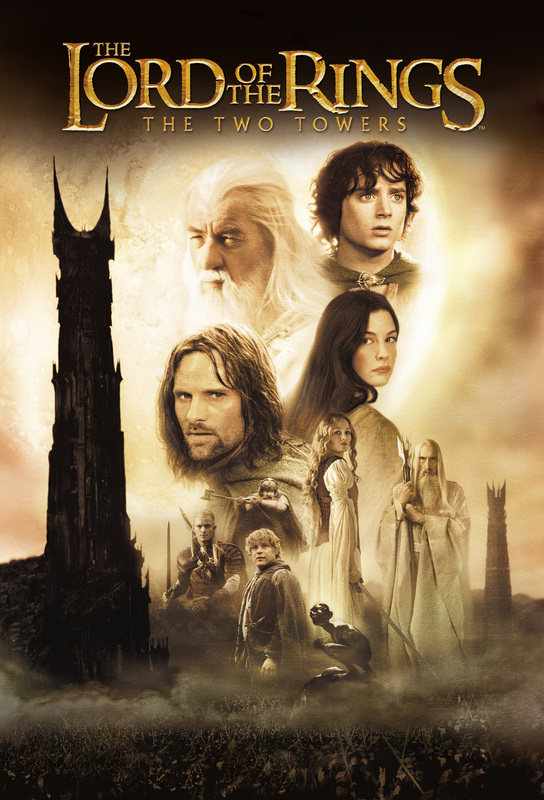 As the middle installment, The Two Towers may not have made American Film Institute’s list of the all-time greats like thunderous debut that was The Fellowship of the Ring, but it is every bit as important to the overall story and essential of a watch as its predecessor. 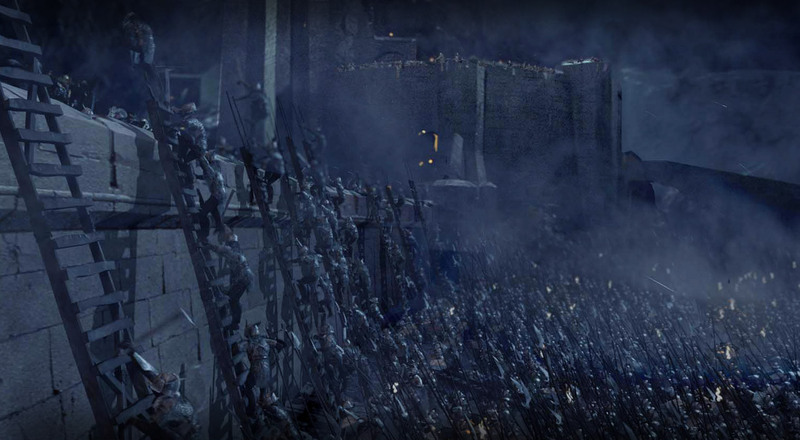 The Battle of Helm’s Deep is still possibly my favorite action scene ever. Legolas shield surfing. ‘Nuff said. It was the hardest one for them to make but is generally everyone’s favorite. I remember seeing that scene with Gollum talking to himself and for the first time thinking that a digital character could be believable and convincing in a live-action film. The acting by Andy Serkis was incredible and the camera work/editing enhanced the creepiness. Again, this is where Jackson outdid Lucas whose CGI character Jar Jar was such a disaster. Seriously. The Two Towers is definitely my favorite of the movies, and Andy Serkis is a mo-cap genius. I do feel The Return of the King is the best, but that’s mostly because it wraps up the story. I can certainly understand liking The Two Towers the most because it’s when The Lord of the Rings begins getting really good, though there’s not a single weak installment in the trilogy. I do think it’s better than Fellowship, though I have to say that The Return of the King edges it out. It’s a moot point though, because all three films are winners. Jar Jar is a pretty low bar, but between Gollum and Caesar from the Planet of the Apes reboot trilogy, I can safely say Andy Serkis is a motion capture genius, and Peter Jackson really sold me on him. I’d have to agree with you on that one; even the original Star Wars trilogy wasn’t this consistently good. Jeez, I hope no one reads this comment section! I wouldn’t want them to learn that Frodo dies in the first ten minutes of The Return of the King; I have to admit I didn’t see that coming.